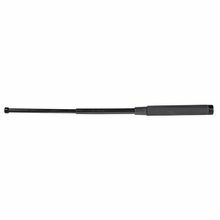 21 Inch Casco Telescopic Batons including nylon baton holder on sale for under cost. Compact friction lock Casco batons to meet the needs of law enforcement. The Casco batons are available in 21 inch expanded length. These are made from hardened aircraft alloy steel (ASTM-A-519), hardened to Rc48-Rc54 and tempered to relieve stress and brittleness. Casco baton grip is a rubberized super grip for great hold. Shaft finish is black. Black finish is highly rust resistant and requires minimal care. Casco batons are made from the highest quality materials using many ASTM and Military Specifications, along with utilizing precision tooling, which will ensure years of trouble-free service. All Casco expandable batons used to have a repair or replacement guarantee, under normal field use, against breaking, bending, torn grip and if rust or corrosion prevents the baton from functioning. Los Angeles Police Department used to use these batons for years. These batons are left over from a warehouse and have been stored in air conditioned space. They are brand new and show no signs of any deterioration. These items are being sold below cost.